Given the choice, I’ll nearly always opt for coffee over tea, especially when I can get my coffee from a superautomatic coffee machine. However, as much as I rely on coffee’s high caffeine content and strong aroma for their stimulant properties, I do enjoy a nice cup of tea from time to time. Recently, I’ve been on a white tea kick; Earl Grey is my default choice. Making tea is no more complicated than making coffee, but you do have to be careful with white tea not to have the water too hot (whereas it should be boiling for black or green tea). And, of course, you want the tea to steep long enough—but not too long, lest it become bitter. Now there’s a machine that does for tea what my Saeco Royal Professional does for coffee: automates the whole process, making it virtually foolproof (regardless of what kind of tea you’re drinking). The Zarafina Tea Maker has three slider controls. One lets you set the type of tea, one indicates whether the tea is loose or in a bag, and one determines the strength. Pop your tea into the hopper, set the controls, and turn the machine on. It heats water in its built-in tank to the proper temperature, soaks the tea leaves in it for the proper time, and then dispenses the final product into a ceramic teapot. Although I haven’t tried it, it looks like a brilliant concept and a well-executed design. And, at about $150, it’s an order of magnitude cheaper than a good superautomatic coffee machine! Update: This post was featured in The Coffee and Tea Festival (#14). In general, boiling water should not be used to prepare green teas. I got one of these for Christmas, and I have yet to get a good cup of tea out of it. The tea has an off taste to it that’s quite noticeable even with a strong black tea. The chamber in which the tea steeps is plastic, too, which can’t be helping. There’s a reason they don’t make teapots out of plastic. I don’t recommend this machine. Sappy: I guess it depends on who you ask. I’ve generally heard that water for both green and black tea should be boiled, but that water for white tea shouldn’t. I’ll have to do some side-by-side experiments one day to figure out which I like better. Ton: I’m very sorry to hear about your bad experience! Thanks for letting us know. I can’t deny that these types of gadgets look intriguing, but I haven’t been tempted to give up my tried and true $10 kettle yet. Just had my first pot of green and it is awesome! Wonderful for those rushed moments in the morning. It was green tea, and for the record, green tea needs water that’s around 190 degrees, so that would be just when it starts to get to a slow boil, way before the kettle sings. Of course, if you have one of these, just slide the lever to green! I’ve had my Zarafina for over a month now, and love the tea it makes. I drink a lot of tea, both black and herbal, and always forget to take the tea bags out after steeping – resulting in some terribly bitter brews. This takes care of that problem as once the tea has steeped, it is decanted into the teapot. I keep it on my desk at work, and as soon as the tea is done, pour it and drink it. I’m also tasting more of the undertones in the tea, flavors I’d missed before by over-steeping the tea. I dithered a long time before buying it, but I sure am glad I did. Mary: Sorry, I don’t have any idea – perhaps another reader can offer a suggestion. I got it last christmas to replace the first ever auto TEA maker back in 1983 or so made by Krups. Sadly my Krups died and no longer replacement parts. This one is great but my complaint is same as above in that it leaks when pouring into pot a bit. i don’t find it keeps it warm enough when I go to get the second tiny cup. BUT WHAT I DISLIKE IS THEY ONLY MAKE 16 OUNCE SIZE. I LIKE TWO BIG MUGS AND THE OLD KRUPS GAVE 6 CUPS. DOESN’T MANUFACTURER WANT TO GIVE US LARGER CHOICE?????? Love it, I have the zarafina tea-maker suite for 5 years and make so many different teas with it ( always organic) so I never end up with a bitter, just pure and non metallic tasting tea. ( if the tea chamber is made of aluminum it not only causes tea to have metallic taste, but the alum ends up stored in your brain cells for one, can cause Altzheimers) best to ovoid!! 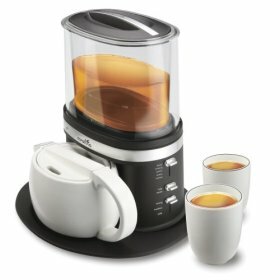 I could not live without this tea-maker, wish they also offered a 4 cup and can’t seem to find the replacement ceramic tea-pod.